I knew I was onto something delicious as I folded the last few ingredients into my zucchini bread batter this afternoon. Sometimes you just know. The thick and creamy batter was flecked with hundreds of green-lined strands of shredded zucchini nestled alongside the occasional flare of yellow lemon zest. The poppy seeds quickly spread themselves into an impossible network of connect-the dots, and at the same time, one of my favorite curry powders was sending notes of coriander, cumin, and clove up from the mixing bowl to tease my nose. There are many zucchini bread recipes out there, plenty of them tried and true, but this time around I wanted to bring my own take to this seasonal classic. In many places zucchini season has arrived. It's flooding out of your gardens, gobbling up real estate at farmers markets, and taking center stage at grocery stores. Zucchini bread is one of the most popular vehicles for this prolific summer crop because it is delicious, portable, easy to share, it involves baking, and most importantly - it gets rid of zucchini. 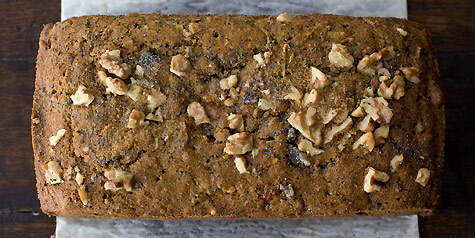 You'll no doubt notice that most zucchini bread recipes you come across yield two loaves. Why? Because if you were to only make one, you wouldn't put a respectable dent in the zucchini supply. For example, if I were to cut my zucchini recipe in half, I would only get rid of 1 1/2 cups of grated zucchini - the equivalent of one large zucchini? No good. What else should you know about today's recipe? I thought about doing a more Thai-inspired version, using coconut oil in place of the butter, beating in a small dollop of Thai-curry paste at the beginning (omitting the curry powder later on), using chopped toasted peanuts, adding some grated coconut, etc. There are infinite versions you can try here using different nut and spice combinations. Or, you can strip out all the noted optional ingredients, and you have yourself more of a classic, traditional zucchini bread. Feel free to throw out your ideas in the comments, I love to hear them. A time-saving tip: if you have a food processor with the grating attachment, use it to shred the zucchini. It will perfectly shred three zucchini in about five seconds. On the flour front, this recipe calls for whole wheat pastry flour, it lends a nice, tender crumb to the zucchini bread - feel free to swap in unbleached all-purpose flour if it is more convenient or happens to be your flour of choice. Also, this recipe calls for curry powder, I also did a delicious version with a Raz el Hanout spice blend from one of my favorite local spice blend producers, highly recommended! Just swap in 1 tablespoon of the Raz el Hanout in place of the curry powder. Preheat your oven to 350°F. Butter the two loaf pans, dust them with a bit of flour and set aside. Alternately, you can line the pans with a sheet of parchment. If you leave a couple inches hanging over the pan, it makes for easy removal after baking. Just grab the parchment "handles" and lift the zucchini bread right out. Divide the batter equally between the two loaf pans. Make sure it is level in the pans, by running a spatula over the top of each loaf. Bake for about 40-45 minutes on a middle oven rack. I like to under bake my zucchini bread ever so slightly to ensure it stays moist. Keep in mind it will continue to cook even after it is removed from the oven as it is cooling. Remove from the oven and cool the zucchini bread in pan for about ten minutes. Turn out onto wire racks to finish cooling - if you leave them in their pans, they will get sweaty and moist (not in a good way) as they cool. A moist, tender buttermilk cornbread packed with corn kernels and flecked with red pepper flakes. Simple and delicious.